About 10 days ago I was preparing to go to Kennesaw State University to deliver a Phired Up Dynamic Recruitment Workshop. I was excited to present as I always am, but then I checked my E-mail that morning and noticed this story! Wow! Is that for real? And I get to go there? See the video below. See, just days ago their chapter brother Richard Bland had vulnerably shared with the men that he would need his second kidney transplant. His kidney was failing and since he has a rare blood type he’d have to go on dialysis for a while. The Delta Tau Delta chapter men, at about 11 p.m. that night, had the thought that maybe The Buried Life cast members would help them out when they visited the next day, so they started tweeting with the hashtag #SaveRichard. Within a couple hours #SaveRichard was trending in Atlanta… then in the U.S… then the WORLD! At 2 a.m. the chapter gets a call from The Buried Life to let them know that they’d feature them the next day. By 10 a.m. the chapter (after staying up most of the night) had arranged a rally, had gathered the Greek community and other campus friends around the cause, and had created something of an overnight movement all to help #SaveRichard. By the end of the next day, they had raised thousands of dollars, and over a dozen people VOLUNTEERED TO DONATE A KIDNEY, and had done something incredibly generous for their brother. The power of organizations to rise up at moments of need or opportunity and do something important is inspiring. This chapter chose to be bold and do something special. What will you do when the moment arises? We’ve shared a similar inspiring story before (see here) that always makes me think… organizations like fraternities and sororities have the capacity and opportunity at any moment to do special things, important things, life changing things, world changing things… The question is will they choose to act and inspire others to follow them. If they do, some of the best people on campus and in the community will likely become even more interested in joining with them to accomplish their powerful purpose. PEOPLE: Recruitment is a relationship business. We spend a lot of time on this message. Recruitment is primarily done through deep personal connection, trust, and individual people giving the gift of membership to other people. PURPOSE: Recruitment requires a purpose to recruit people into. Inspire others by doing something special, and special people will want to be a part of it. High quality people are attracted to high quality stuff. If you have a compelling purpose, if you’re working together as an organization to do something important, then it is likely that people will be interested and inspired to join you. How long do you need to know someone before you offer them a bid? The correct answer is E… none of the above! The problem with this question is that it is too focused on time. Instead of being focused on the quantity of time we know someone before we offer a bid, we believe it’s more important to measure the quality of the relationship that you have. Let’s go back to the basic definition of a bid – we are offering someone membership into our brotherhood/sisterhood, we are telling someone that we want to know them and be their friend for the rest of our lives, and we are acknowledging that someone shares the values that our founders defined hundreds of years ago. When we think of offering a bid in those terms, rather than time frame, we are focusing on the relationship. The relationship matters. In formal recruitment we have a short period of time to turn strangers into friends and friends into brothers/sisters. At the end of the structured week we offer bids and have a giant celebration to mark the beginning of the journey of actually getting to know one another. Bidding doesn’t always have to be like that (and shouldn’t). In the Dynamic Recruitment process, we can focus on the quality of relationship. There is no time frame of events; rather, we get to know people in more normal and natural environments. Then, we offer lifetime membership and friendship. We have been to sororities (and fraternities) all over North America, and we see one common theme: when practicing Dynamic Recruitment sorority women, especially, become impatient with potential sisters after they have not made a commitment within 2 weeks or one month. We always ask this in response: How has the time you have spent together been spent? Hint: we want to know about the quality of your relationship. Would she say you two are friends? Would she say you are someone she can call when she needs a helping hand? Would she say you are going to be one of the first people she calls when she gets her dream job after college? If the answer to any of these questions is no, then the quality of your relationship has not developed to a point where you are done ‘recruiting’ her. It is too soon to ask her to be a member of your organization for 5, 6, 7, 15, 25, or 50 years. Don’t overlook a potential member because your relationship has not developed yet; instead, ask yourself ’what can I do to get to know her better?’ Because chances are, if she answered no to any of the above questions, then there is a high probability that you don’t know her well enough to determine if she shares the characteristics and values of your founding sisters and the women within your organization today. Here’s another way to know if you’re ready to give someone an invitation for lifelong membership in your organization. Look at your Values-Based Selection Criteria. Do you know, beyond a shadow of a doubt, whether or not the potential member meets or exceeds your criteria? Again, this is based on the quality of your relationship, not on the quantity of time you’ve spent together. You know how at the end of national news broadcasts they promote their web presence and encourage viewers to visit their online channels … this is the same thing except this is a tangible take away from any event, activity, or conversation. There are lots of reasons for creating the Social Media Card. Here are a few that were most important for us. 3. Increases and clarifies your social media presence. Ever logged onto Facebook, searched for something, and the result came back with multiple possibilities? The Social Media Card allows you to get your specific Twitter handle and Facebook page identity in the hands of your target audience. As an office, we use the Social Media Cards to gain followers on Twitter and friends/fans/followers on Facebook. It’s like getting people added to your Names List, but online. The next step is offering useful information. For example, we tweeted spring break safety tips and have gotten an average of five re-tweets from fraternity/sorority headquarters. new scholarship opportunity, or a reminder about an all campus Greek recruitment event. We’ve started thinking about our Facebook and Twitter presence as an extension of our Names List. People who follow you that you barely know may become your next best source of referrals. online if no one is listening. The Social Media Card allows us to speak directly with our followers and friends who care most about our cause on multiple social platforms. Joe and the High Point University fraternity and sorority community found a practical strategy that is helping them bring more people to their cause. That’s got Social Excellence written all over it. Great job and thanks for sharing a cool recruitment resource with the world. Congratulations everyone, you made it! Three fourths of the school year is over. It’s time to put the North Face fleece and UGGs back in the closet and bust out the flip flops. Sundresses, sunglasses, shorts, and Frisbees; the best part of the year is starting. Well, the second best part. . .
It’s that wonderful time of year again . . . SPRING BREAK WHOOO HOOOO (please tell me you got the “Friends” reference)! So here’s my post-Spring Break challenge for you, should you choose to accept it, and I think you should: When you get back to school after Spring Break and you’re back in the trenches of classes and recruitment, make it a point to drive names onto your names list. 1. Make a new friends: When you’re back on campus, talk to the people around you in classes, at Starbucks, at the gym, at the book store, etc. Be generous with your time and be curious about their Spring Break. 2. Engage in conversation: Ask questions about their time away from campus. Who knows maybe they went back to their hometown and reconnected with their roots, maybe they went on a Caribbean getaway, or maybe they went on Alternative Spring Break. Ask questions that are “below the surface”. Be interested. Build a relationships. 3. Have a reason to follow up: This could be anything from wanting to hear more about their service trip to wanting to hear more about their hometown. Maybe they spent their time at home working on a Biology lab and you just happen to kick serious a$$ as Biology and you offer your help. Whatever reason comes up, awesome, just run with it and be vulnerable enough to give your digits. Yes, you give them first! You have to give to get. But you can’t give without having a reason to follow up. Drive more names onto your names list. And for gosh sakes, get out there and enjoy the sunshine! Do this quick exercise: Think about the last interpersonal interaction you had. Using your thumb as an indicator, rate the quality of that interaction. Thumb straight down indicates that the interaction was dull, regular, average, “in the middle,” boring, ordinary, flat, or downright bad. You walked away saying, well, nothing, because the interaction had hardly any impact on your life. Use your thumb as a an indicator and lock in your rating now — feel free to put it somewhere in the space between straight up or down. How would the people you interacted with rate you? Thumbs up? Thumbs down? Somewhere in the average middle? Social Excellence is about… EXCELLENCE (not average). Social Excellence is found in the quality of our every day interactions. Social Excellence challenges us to create “thumbs up” experiences. The quality of your interactions determines the quality of your day, your reputation, and your life. The quality of your members’ interactions determines the quality of your organization. Want to have a high quality organization that impresses people and that has a reputation for excellence? Focus on the small, momentary, interpersonal interactions your members have with others. Organizations only exist in the space between members and their interactions with others. That space is filled with our interpersonal interactions, our behaviors, our choices, our words, our actions. The quality of those cumulative interactions, then, determines the quality of our organization. What if you had someone following you around all the time using their thumb as a scale to rate the quality of your interactions with others? Are you giving “thumbs up” experiences to others? Social Excellence, when chosen as a lifestyle, gives you the power to create “thumbs up” experiences for everyone you interact with. You can choose to “Be The Person” who has surprisingly high quality interactions all the time. Even if you’re not a huge basketball fan, nearly everyone and their brother gets a bit of March Madness during this time of year, and it is a great recruitment opportunity. Here are two ways to plug some March Madness into your Dynamic Recruitment plan. 1. Host a March Madness bracket competition to drive names onto your Names List. Maybe even do it for charity. Distribute brackets, collect people’s predictions, compile data, and most importantly, get everyone’s name and contact information. We don’t condone serious gambling on college sports, but we know that people will gladly pay $5 to get in a pool with their bracket. They would be even more prone to doing so if 1/2 of the pot went to the winner and 1/2 of the pot went to a great charity. Consider being the organization that organizes the mass March Madness hysteria on your campus. 2. Looking for some small activities to engage potential members in? Well, it turns out that during the month of March there will be something like 63 amazing drama-filled basketball games on TV. Watch them with your friends. Enjoy. Phired Up’s own Matt Mattson was helping to recruit fraternity men at Georgia Tech University, and helped that chapter add 75 names to their names list one morning by tabling with a March Madness bracket competition. Read about it here. Stopping every student that walked by and asking “Did you fill out your bracket yet?” started some amazing conversations throughout the day. I think it has a lot to do with a fear of rejection. A fear of that person saying, “No, it’s cool… I have seen what your organization is all about and it is not for me.” But isn’t this what we want? Don’t we really want to know what the highest quality people on campus actually think of us? Don’t we want to truly understand the reasons people wouldn’t make decision to join our amazing life-changing organization? I have some questions for you: 1) Does your organizations change lives for the better? 2) Does your organization make an amazing and positive impact on the lives of everyone they touch (when done right)? If the answer is yes then let me tell you something… Your organization (and the potential member) deserves the respect of having a real, serious, and vulnerable conversation about the potential of lifelong membership. Do not be afraid of rejection — it happens less than you would think if you are doing fraternity or sorority right. I am here to tell all of you to stop living in fear and DTR. Define the Relationship. Now I know it is easy for me to say, and more difficult for you to do, but let’s spend the next few moments changing your frame of mind. I always say if you are good at recruiting you are going to be good at dating… they are very similar. You need to find out if the people you meet are going to stay in your friends category, or if they are going to enter into a lifelong bond, FBO (facebook official), sit in a dark room and share secrets category… come on we all went through initiation. The only way you are going to figure out what category they fit into is by DTRing. Defining the relationship, having a real conversation about your fraternity or sorority with a high quality individual can change the world forever. Either they will say no, and you can put it to rest (after you’ve made sure they don’t just misunderstand the situation) or they say yes. And if they say yes then it will change their life and the life of your organization forever. If you are trying to recruit the highest caliber of individuals into your organization, so you can become a quality organization… your organization deserves to have a high caliber and high quality conversation with potential members that breaks down, what your fraternity/sorority is all about, that individual’s values and expectations and any concerns you might run into along the way. If they run screaming (just kidding no one will do that) but seriously if they can’t handle the idea of getting serious — having a powerful one-on-one conversation about their level of commitment — they were never serious about your organization to begin with… and recruiting people who are afraid of commitment and afraid of the DTR are never going to fit into a high quality organization or relationship. Sit down with those people on your list. Look them with care and love in your eyes, and DTR. 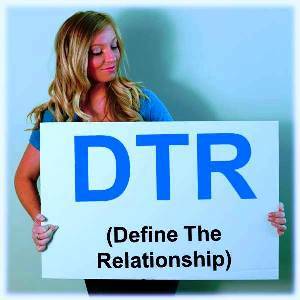 Define the Relationship so you know where you stand. Check out the sorority “Excuses, Quality Responses, and Pre-Close” document. Here’s the fraternity one too.